This design is a tribute to the great Hindemith Sonata for Solo Viola, Op. 25 No. 1, showing its opening three chords and pictures of the composer superimposed over a lovely instrument. 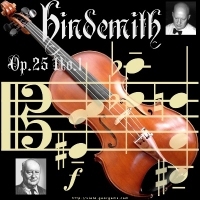 What a great gift for any violist or admirer of Paul Hindemith, especially one who plays this sonata! Get it now on a t-shirt, hoodie, bag or other quality apparel or giftware item, exclusively from Bratsche’s Viola Bazaar! !